One in an occasional series in which FOW publishes articles that appeared in our publications in the past, and still resonate with us today. This piece was written by Steve Lawrence (1921-2012) for FOW’s Winter 2006 Newsletter. He was an FOW Board Member, Chair of the Wildlife Committee, and an avid bird-watcher with a life list of 600 U.S. species gathered from his visits to 49 states. He also was a member of the Delaware Valley Ornithological Club, the Wyncote Chapter of the Audubon Society, and the American Birding Association. During winter in this part of the country, there are fewer birds than in any other season. However, in the Wissahickon, as well as in other similar areas, there are many birds you can find during winter, especially on a morning walk from eight to noon. Between December 15 and March 15, it is highly possible to see up to 50 species in the Wissahickon. There are probably some 70 species that will appear, although some very rarely. On a walk through edge, woods, and creek habitat on a sunny day, spotting 25 species is possible. A bird watcher will see more in the morning, and a route past some bird feeders will help swell the total number of sightings. One must remember, however, that many of the smaller birds move in feeding groups, so a winter walk tends to be moments of activity interspersed with periods of absolute quiet. The birds one may see belong to four groups: permanent residents; winter visitors; lingering half-hearty migrants; and some occasional guests determined by weather conditions. Many of our favorite birds are permanent residents. Heading the list are such bird-feeder regulars as the Carolina Chickadee, Tufted Titmouse, White-breasted Nuthatch, Northern Cardinal, Mourning Dove, and House Finch, as well as four species of woodpecker. The woodpeckers include: the very common Downy and Red-bellied; the occasional Hairy; and the very uncommon Pileated, which can appear suddenly deep in the woods and occasionally in a residential area where a dying tree holds a wealth of ants, its favorite meal. Other permanent residents include the much less common American Crow (numbers depleted in recent years by the West Nile virus), Blue Jay (some stay, some go south), Carolina Wren, Northern Mockingbird, Song Sparrow, and the three non-native species that can prove abundant: House Sparrow; Starling; and Pigeon. 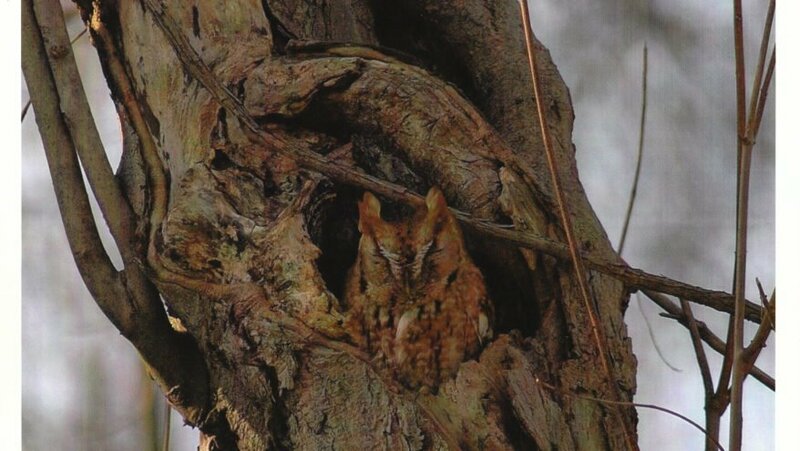 Much loved residents which can be much easier to spot in winter are the Great Horned Owl (whose hoots are heard more frequently as breeding season in January approaches) and the Screech Owl, which often sits in a hole in a tree that faces the sun. Some Barred Owls have located in this immediate area, and in winter an occasional spotting of a Long-eared Owl is possible, especially in the Meadow above the Andorra Tree House. The White-throated Sparrow and Dark-eyed (“slate-colored”) Junco both come from the north and enjoy frequenting bird feeders. Less common and not as likely to be spotted at feeders are Golden-crowned Kinglet, Winter Wren, Brown Creeper and that favorite of comics, the Yellow-bellied Sapsucker. At one time the Purple Finch and Pine Siskin were regular winter visitors, often at feeders, but the number of northern finches heading this way in winter has decreased greatly in recent years. So-called “half-hearty” species—birds that normally migrate far to the south but occasionally stay in limited numbers—offer some nice surprises. One exception is the American Robin, a species that 25 years ago was seldom seen between early January and mid-March. Now, flocks of Robins that summer well to the north find enough fruits and berries (and worms during a January thaw) to survive very nicely. Flocks of 25 to 50 are now seen regularly throughout the Wissahickon area. Other birds that stay in limited, occasional, or rare instances include the Hermit Thrush (Walt Whitman’s favorite), the beautiful Cedar Waxwing (sometimes observed feeding on winter-ripening wild fruit alongside robins), Ruby-crowned Kinglets, and less frequently, Gray Catbird, Eastern Towhee, and Fox Sparrow. In the Wissahickon Creek itself, there are often a number of feral Canada Geese and Mallards (always available at Valley Green). Rarely, during the middle of winter if the water isn’t frozen solid, a Great Blue Heron will be spotted or a Belted Kingfisher will be heard giving its rattling cry. In the air on clear days, over fields and woods, wintering raptors may be seen. The Red-tailed Hawk is most frequently spotted, and at times Turkey Vultures will circle overhead. Two marvelously swift and sudden accipiters, the medium-sized Cooper’s Hawk and the smaller and more frequent Sharp-shinned Hawk, are the bane of bird feeders. They demonstrate “survival of the fittest” when they rush one. All in all, there are plenty of colorful birds to be seen in the Wissahickon in winter. Before winter ends, one begins to hear more and more bird song. Let it lead you into and around the woods and fields of the Wissahickon. 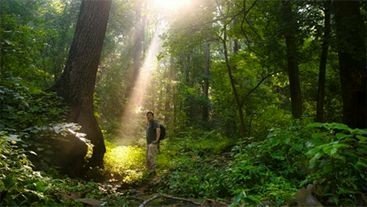 You can support FOW’s efforts to preserve important bird habitat throughout Wissahickon Valley Park. Donate or become a member today!